This is an annual EVO event where moderators for the EVO sessions listed at http://evosessions.pbworks.com meet from noon GMT in Google Hangout to talk about their sessions and take questions from interested participants. Venue was to be decided, and turned out to be Google+ Hangout, Second LIfe, WiZiQ and Elluminate: http://learningtimesevents.org/webheads/, all skillfully juggled by master wizard behind the curtain Jeff Lebow. Ten people at a time can be in a Hangout, but the event was streamed so that anyone could listen to the stream while it was being broadcast or later via the recording. 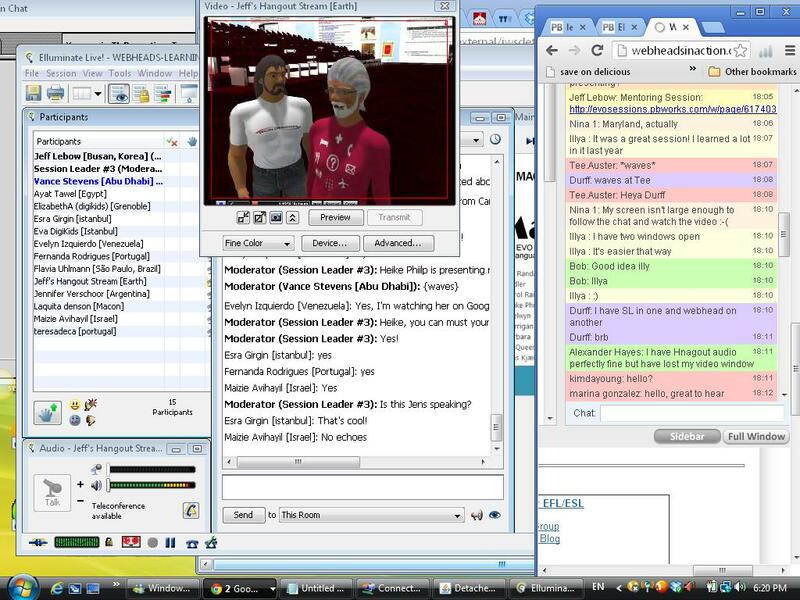 The stream bounced in and out of Google+ Hangout, Second LIfe, WiZiQ, and Elluminate, where people met up to speak about their sessions and get help if they were having trouble with Google Hangout. The stream URL or widget will appear at http://webheadsinaction.org/. There is also a text chat there. You can visit there now to see last year’s example. Anyone wishing to comment on the stream, or get help with Hangout can come to http://webheadsinaction.org/ and use the text chat there, or visit http://learningtimesevents.org/webheads/ for text and possibly voice chat. 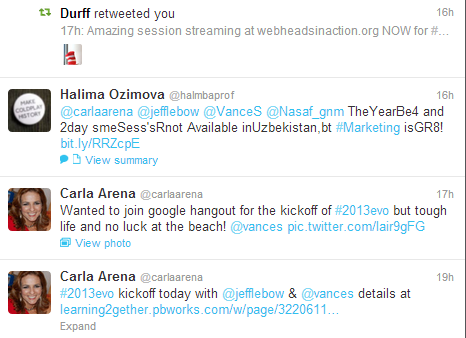 The URL for the hangout will be available in those places and will be revealed at launch time. – If planning to speak in the Hangout, please use a headset to avoid echo. Jeff is a notorious audio stickler and will mute any echomongers 🙂 but you’ll be invited to resolve the problem and return.